This post is sponsored by Nutella®, but all opinions are my own. My kids are such picky eaters, especially my son. I’m constantly looking for new ideas for meals to change it up. 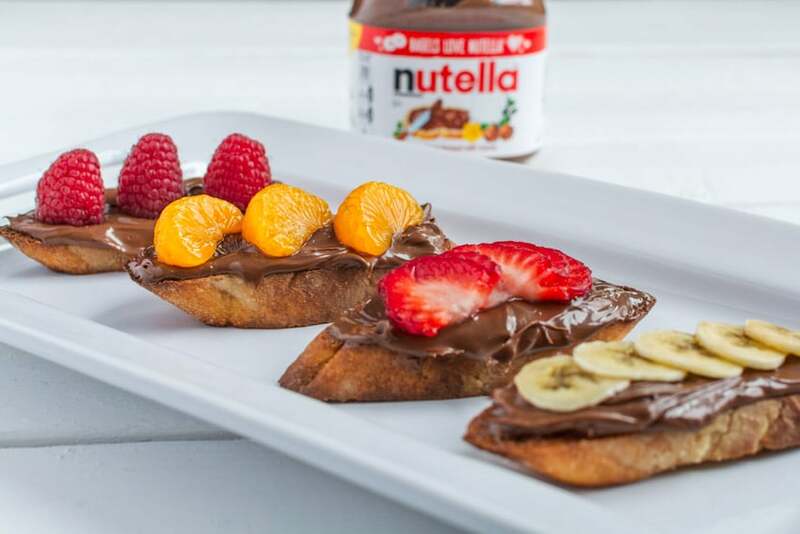 These breakfast bruschetta with Nutella® Hazelnut Spread are super easy to make, taste fantastic, and are a fun way to shake up our breakfast routine. Plus, it is so versatile to use with toast, fruit, and yogurt. I love including Nutella® Hazelnut Spread for breakfast because it is made of seven quality ingredients such as hazelnuts and cocoa. It doesn’t contain artificial colors, preservatives or high fructose corn syrup. All you need is a little bit of Nutella® Hazelnut Spread. My son is five now, but his picky eating habits haven’t really improved at all over the years. I can usually get him to try one bite, but he’s already made up his mind that he won’t like it. It can be such a frustrating process. The great thing about the breakfast bruschetta recipe is that I let my kids choose their fruit toppings so I am sure they will like it. Plus, then they’re getting some good nutrition and I’m happy because it’s such a super easy, on-the-go breakfast for me to make. This recipe couldn’t be simpler to make. To start, I bought a baguette and sliced it on a bias so the pieces would be long and thin. Then I preheated the broiler and put a bit of butter on the bread. I broiled it for a couple minutes, until the bread was golden brown and crunchy. At this point, you could definitely add some other spices on the bread to give it a spicy base. I let the bread cool slightly and while the bread was cooling, I prepared my fruit toppings. I chose to slice bananas and strawberries, and then I also bought a can of mandarin oranges and some raspberries. 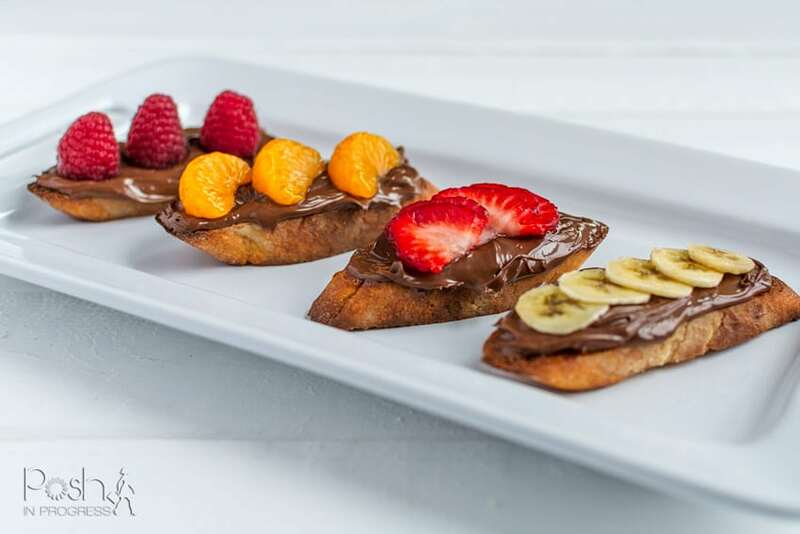 The best part about this simple breakfast bruschetta with Nutella® Hazelnut Spread is that you can literally make any combination that you like. 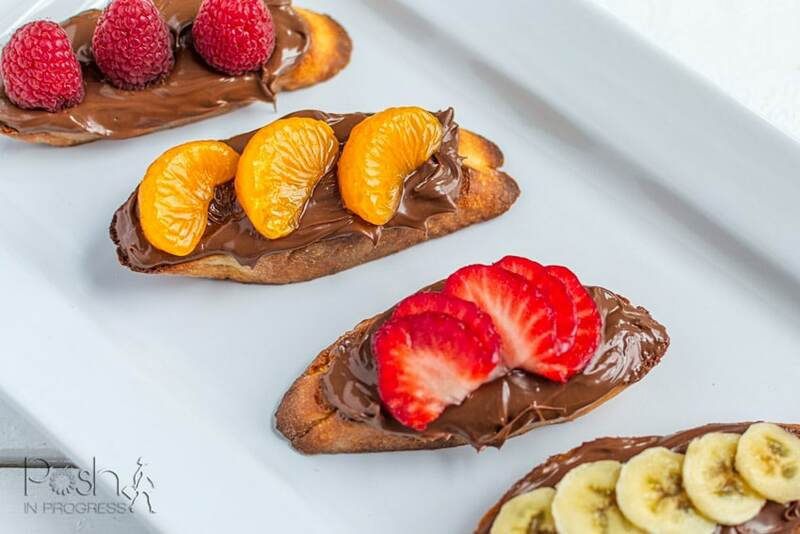 I chose to do fruit toppings, and I love how fruit tastes with the Nutella® Hazelnut Spread, but you could also add different types of fruits, nuts, and spices. This would also be a fun recipe to make with your kids because you could create a little breakfast bar and let them choose different toppings to create interesting and fun breakfasts that your kids will love. 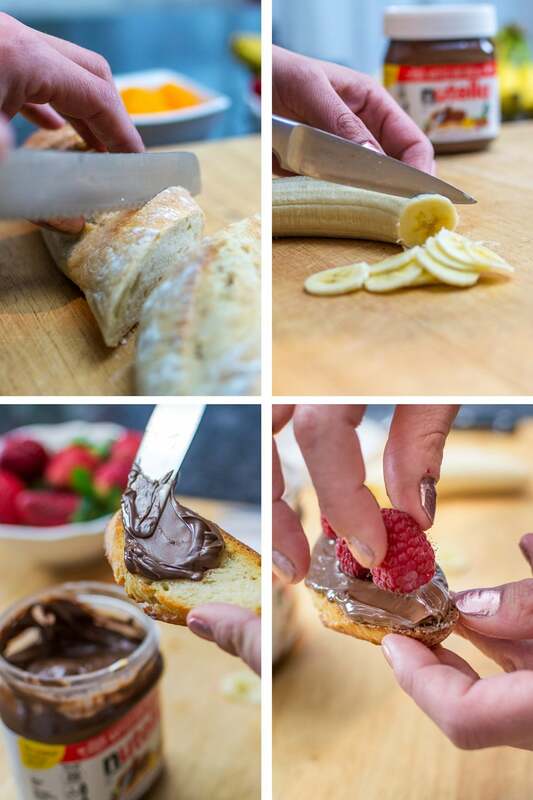 There are endless ways to incorporate Nutella® Hazelnut Spread into breakfast recipes. It tastes great on top of pancakes or waffles and is a great addition to your croissant or muffin. I hope you’ll try out these breakfast bruschetta and I’d love to hear what combination you love best. Preheat the broiler. Slice the baguette on a bias to create long-thin slices of bread. Butter one side of the bread and broil until the butter is melted and the bread turns golden brown. Remove the bread from the oven and allow it to cool until room temperature. Spread about 1 tablespoon of Nutella® Hazelnut Spread onto each piece of toast and top with desired fruit, spice and nut toppings. Enjoy!